No cream of mushroom required, this recipe is a creative use of bouillon that I typically always have on hand. 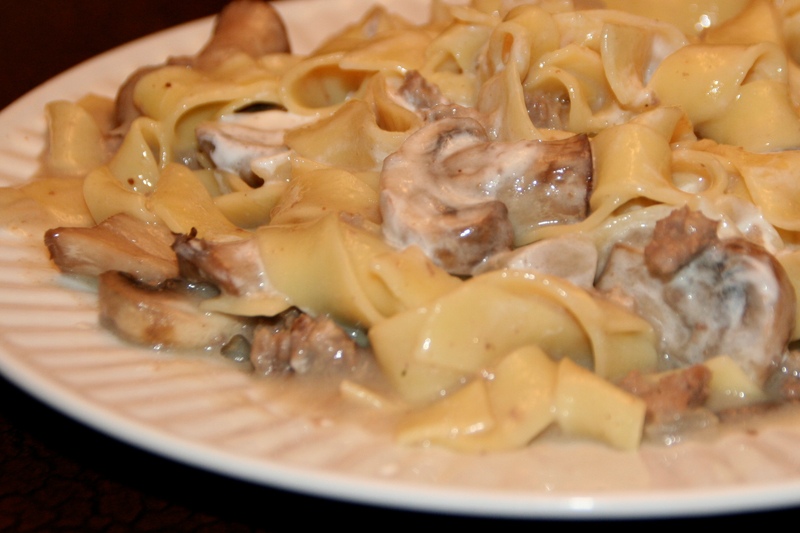 I must admit, there may be many more gourmet recipes for beef stroganoff, but this recipe is quick, healthy and cost effective. Many of the meals in our home are tailored to my family’s taste, which I realize may not be a one size fits all palates. I encourage you to taste your way through the recipe and add more flavor if you desire. Bionature Organic Egg Noodle Pasta, 8.8 oz. In a large sauce pan, brown beef,. If you prefer large pieces of ground beef stir as little as possible; it will breakdown throughout the cook time. Saute mushrooms and onions with beef. Once beef appears cooked, milk, beef base and 3 cups water. In a soup bowl, create a roux with the flour and milk and stir into sauce pan. Allow time to thicken. Strain water from noodles. DO NOT rinse and add to sauce (it will hep thicken the sauce a bit more). Stir in garlic salt and salt and pepper to taste. Allow time for pasta to absorb flavor.